A former 12th Air Force Command Chief Master Sergeant [Jose A. Barraza] is headed to court-martial on 17 Uniform Code of Military Justice charges, including two sexual misconduct charges, an official said. “Arraignment will take place at Davis-Monthan [Air Force Base in Arizona]” on Aug 29, and “the trial is set for October 14,” Air Combat Command spokeswoman Erica Vega said in an email. Barraza originally faced 15 violations under the UCMJ, but the service in May added two sexual misconduct specifications under Article 120c after an Air Force Office of Special Investigations inquiry into the former member of the 12th Air Force commander’s advisory team, officials told Military.com at the time. UCMJ Article 120c charges stipulate offenses such as indecent viewing, recording or broadcast, forcible pandering, or indecent exposure. The original charges include one specification for willfully disobeying an order, seven specifications for dereliction of duty, two specifications for making false official statements, and five specifications for obstruction of justice in violation of UCMJ Articles 90, 92, 107 and 134 respectively, according to a statement from the command. 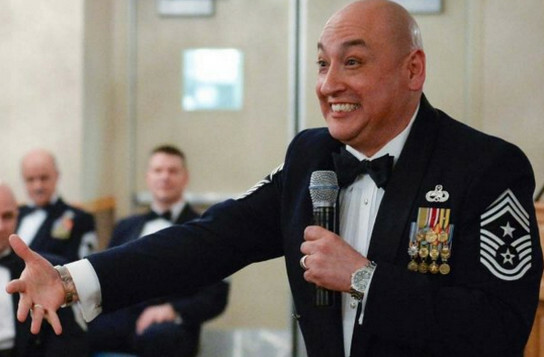 Be the first to comment on "USAF Chief Master Sgt Charged with Sexual Misconduct"